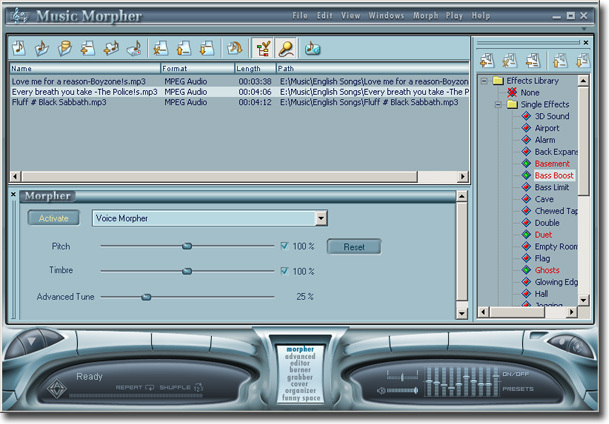 Download AV Music Morpher free basic version - The cool audio converter and professional CD creator software! "There are many audio editing programs in the market that cater for different needs. When you choose AV Music Morpher, you will get a program that serves the needs of both experienced users and novices adequately. Its Voice Morpher function will help you to change voice into two different dimensions...."
"Music is an essential part of any successful party. I had been thinking a lot about how to make the music and the atmosphere of my upcoming party exciting and totally unique; but how could I do it? A DJ could be very expensive..."